Image: Don LaVange/Flickr//Original photo was cropped but not altered for this article. You can’t open a cookbook without stumbling across a few French phrases. But do you know what they mean? You will by the time you finish reading this. A lot of great things come from France — Chanel, cabaret and kissing, of course. But if you love food, you can’t ignore the massive influence the French have on all the great things we put into our face holes. It’s not just the type of cuisine (also a French word!) that we enjoy either. There’s a whole slew of French terms and techniques that make up the universal lexicon of the kitchen. They are so common that we don’t even think twice when we see them. You see “sauté,” and you know that has something to do with shuffling some bits of veggies or meat around in a pan by mashing at them with a spatula, so you do it. But do you do it right? You should. And not just because it will give you that sense of smirking superiority that comes with being better than your friends at something, but because you are an adult now, damn it. It’s time to start making your bed regularly and balancing your checkbook and blanching your peppers when the recipe calls for it instead of just skipping that step because you don’t feel like looking up what “blanch” means. 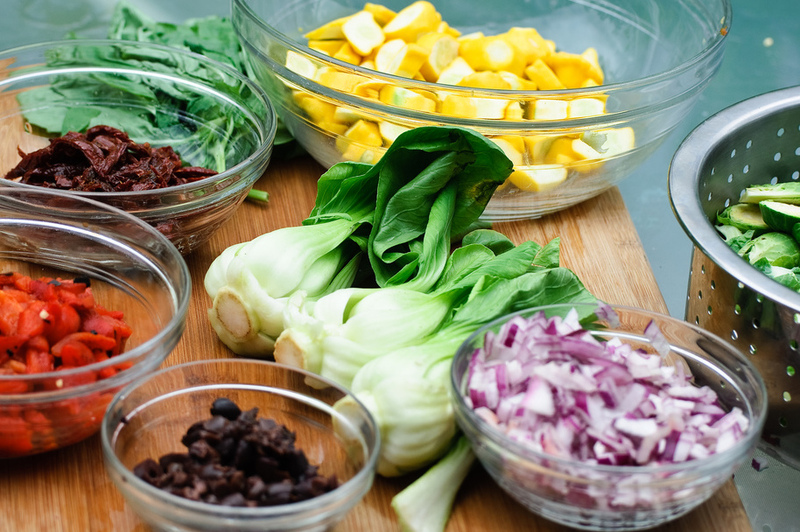 “Mise en place” is a French term that literally just means “putting in place.” It’s also a great place to start for our purposes, because if you have fingers and bowls, you can master it easily. It’s also the first thing you should be doing before you start cooking. All you have to do is look through your recipe and prep all your ingredients. That way when it’s time to add 1/2 cup of julienned (we’ll get to that in a second) carrots to the pan, they’ll be ready to go; you won’t have to run around your kitchen, chopping herbs and measuring stock. “Julienne” refers to a specific type of culinary knife cut, one from which the food will resemble little matchsticks when you’re all done with it. A standard julienne cut will result in pieces that are 1/8 x 1/8 x 2 inches, but don’t grab a ruler or anything. If you go a little thicker, the name for what you’re doing is “jardiniere,” so you can always play it off. … and voilà! You’ve executed the perfect chiffonade! It’s like magic, only less dorky! Tender veggies will need only a minute to cook, but tougher root vegetables like carrots might need up to two minutes. When you sauté food, there’s actually a method to it. You can’t just smack your mushrooms with a spatula for a few minutes and call it a day. Sautéing refers to the process of cooking something over high heat in some kind of fat, usually butter. The key is to keep the food moving quickly, but unlike with a stir-fry, you should be flipping or swirling the food. “Sauté” literally means “jump” in French. So let’s go back to the mushrooms: Ideally you would let your pan preheat and get your butter melted (but not brown) before adding them. Then let them sizzle for a bit before moving them consistently, flipping them back and forth a bit until all the contents of your pan are evenly browned. Déglacer is the gateway to pan sauce. When you “déglacer” (or deglaze) a pan, you’re adding a liquid (usually stock or wine) to the bottom of a pan that you just cooked something delicious in. This will help loosen all the browned bits stuck to the pan. Let the liquid boil, scrape the bottom of the pan, and then stir. … and stirring continuously until you get a thick but not sludgy sauce. The best ratio to use to start is 1:1:1, so you would use 1 tablespoon of butter, 1 tablespoon of flour and 1 cup of milk. Classic béchamel is typically seasoned with nutmeg and a bay leaf. Of course, this is by no means a complete list of French terms or techniques that you can use to rub your culinary prowess in the faces of your dear ones, but it’s a great place to start. At least now no standard cookbook should mystify you.